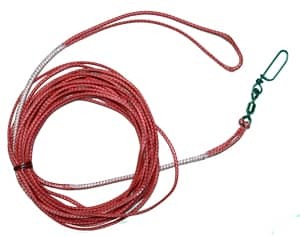 Incorporating the latest in materials technology and remaining ahead of the game in all arenas of the sport, Tournament Cable is pleased to offer a complete line of Dyneema Tow Lines made with 1,900lb test Soft Dyneema. Suppler than Mono for better live action with no line memory, Dyneema is easier to handle and stow than heavy mono or cable, and it won’t coil all over the deck. It’s easy on the hands and easy on the boat, and each line comes with a loop at the cleat-end and an extra heavy duty snap swivel on the teaser end. This stuff is high-strength, and UV protected, so you won’t have fraying cable wires to cut your hands or scratch up your boat. And cared-for Dyneema will last a very, very long time. Hand spliced with attention spent on detail, you don’t want to miss this.